A super-powerful, octo-core CPU, but has little to really offer in gaming performance. Hot damn this is some quick, expensive silicon. But even though this brand new, $1,000 eight-core, sixteen thread, Core i7 5960X processing monster is capable of some serious number-crunching, it's probably not the CPU you're really looking for. The i7 5960X is the first, and the most powerful, of the new Haswell E range of Intel CPUs. They represent the processors of a whole new PC platform, comprising new motherboards and the next generation of system memory, namely X99 and DDR4 respectively. But all this is designed to power servers, rather than drive gaming performance. Intel doesn't specifically design chips for PC gamers, with our discrete graphics cards and desktop PCs. They haven't done for years. What they do is develop spankingly good, powerful, efficient mobile processors and ludicrously big, multi-core server chips. 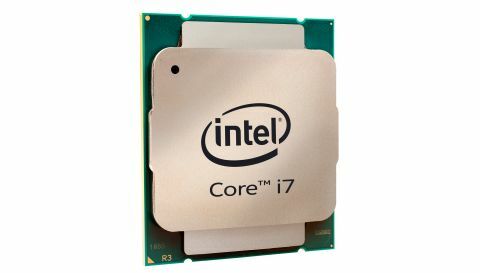 Intel's desktop division then repurposes those mobile chips for use in our desktop Z97 motherboards and does the same for the server parts with the Extreme Edition CPUs, of which this Core i7 5960X is one. That's why the new processors come with support for DDR4 memory. The new memory doesn't do anything particularly fancy on the desktop, but in the server-land it cuts down power demands and boost efficiency. DDR4 doesn't need as much juice and you don't need as many modules to operate at the same capacities. Great in servers, not so exciting on the desktop. Our desktop PCs lie somewhere between the laptop and server form factors that the chip serves. All that extra power doesn't really do a lot for PC games. Better memory hasn't really had much of an impact upon our game, and once you get up to 8GB of decent RAM, pushing the core count doesn't seem to deliver any extra performance either. The Devil's Canyon i5 4690K is capable of the same feats of gaming performance when paired with a powerful GTX 780Ti. The i7 5960X costs nearly five times its price. I'm still immensely pleased that Intel has upped the game on the core front, but now we needgame engine makers to start paying attention. I'm hopeful that, with the advent of DirectX 12 and its native abilities to apportion work across multiple processing threads, such powerful CPUs will be able to deliver quicker, smoother gaming performance. The fact that at 1080p in Battlefield 4 I saw a performance boost of around 12-15% in average frame rate just switching from DirectX 11 to AMD's Mantle with an R9 290X is promising. Unfortunately I saw the exact same uplift from an old six-core Ivy Bridge CPU from the last generation; there was no extra performance boost from the i7 5960X and its full eight cores. As the pinnacle of PC processor-dom though the new Haswell E reigns supreme. It's measurably faster, by some 25% in multi-threaded applications, than the last generation of Extreme processors, and around 85% quicker than the latest Devil's Canyon i7 4790K both at their peak overclocked performance. That's a huge margin, and the fact you can push the i7 5960X up to a shade under 4.4GHz on all eight cores makes it a serious productivity processor, capable of chewing through video rendering tasks like hot silicon through butter. But I could never recommend anyone spend £800 / $1,000 on a CPU for a gaming PC. You'd have to be crazy, or earn footballer money to be able to drop that on a PC build for the performance benefit you (don't) get. So, is the Haswell E a a total bust for gamers? There is another…the cheaper Core i7 5820K could be a good shout for a serious PC gaming super-computer as it doesn't cost much more than a Core i7 4790K itself. The extra platform costs—pricier motherboard and new RAM—could price you out, but at least there is now some middle ground between the standard and Extreme Intel i7 chips. As for the i7 5960X, there's little right now to recommend it to PC gamers. Sure, I wouldn't kick it out of my board if it restarted, but the cost outweighs its rather intangible gaming benefits.